The sun is coming in from an angle in this painting, highlighting the top of the blossoms and the leaves. 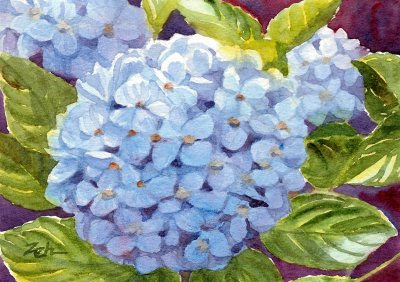 Blue hydrangeas are gorgeous flowers in my opinion. Some are the deepest blue and others brighter like these. They are one of the very few flowers that are a true blue. I painted the background a deep burgundy color to set off the colors and I think it works beautifully!